Former shop mate Sebastian just mailed me a bunch of pictures from our move a year ago. 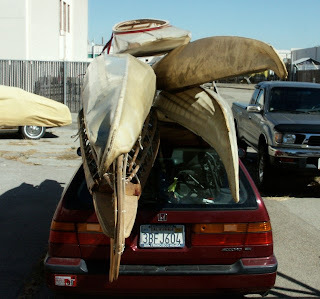 We had a bunch of kayaks to store temporarily till we got our shop set up. Neighbor Dean graciously offered us some space back of his building which was just next door to ours. It was close enough so that we could use the bicycle trailer to move kayaks, as it turned out, we could manage 4 at a time. And then we had to move the kayaks from behind Dean's building to our new shop, a little too far for the bicycle cart, so we used the Honda instead.